During the peak of the global recession the manufacturing sector experienced a significant contraction. This can easily be visualized by the JP Morgan Global Manufacturing PMI, where growth was nonexistent in 2008 and has been better but inconsistent since. Weary consumers and executives alike were hesitant to spend given the concerning amount of economic volatility and uncertainty. For manufacturers, having endured the brunt of the downturn, as economic output increases so to have investments. Executives, especially ones that were reluctant to spend previously, are looking for safe, cost-effective investments that will show business value without a lengthy implementation process. A great area to focus on for leading this resurgence of investment is in quality initiatives. Recent LNS benchmark data shows that Statistical Process Control (SPC) is delivering the required business value. If the right implementation approach is taken, it can meet the safe, cost-effective, and timing criteria needed. Below, I’ll share some of the recent benchmark data from LNS Research’s 2012-2013 Quality Management Survey. It helps to put into perspective why a focus on improving quality with SPC makes sense for many organizations in today’s economic environment. Not surprisingly, when we asked nearly 400 executives which financial objective their organization would be putting the most focus into in 2012, a majority (51%) responded with “Grow Revenue.” The second most selected response, “Grow Operating Margins,” was chosen by only a fraction of that amount (20%). Another question we asked regarded operational objectives. 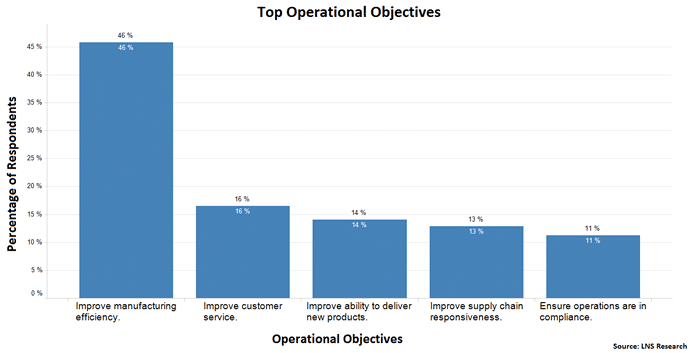 Similar to the financial objective question, a high number of executives (46%) selected one response, which was “Improve Manufacturing Efficiency.” The second most selected response, “Improve Customer Experience,” was significantly lower (16%). These data points illustrate that executives have a considerable interest in improving two areas, manufacturing efficiency and revenue. Our research, experiences, and discussions with leading industry executives show that manufacturers are making progress toward and achieving these financial and operational objectives by tactically improving the quality of products and processes. Specifically, companies are developing robust quality metrics programs that provide visibility into the granular aspects of business processes to identify areas for improvement. One of the most important and holistic metrics an organization can measure to meet these financial and operational objectives is Overall Equipment Effectiveness (OEE), which encompasses three variables: availability, efficiency, and quality. Many organizations today are significantly increasing the power of the OEE metric by streamlining quality data with real-time visibility tools. One question in our survey asks whether organizations currently have, have plans for, or have no plans for real-time visibility of quality metrics. The graph below analyzes the response rate of that question against the corresponding OEE performance. 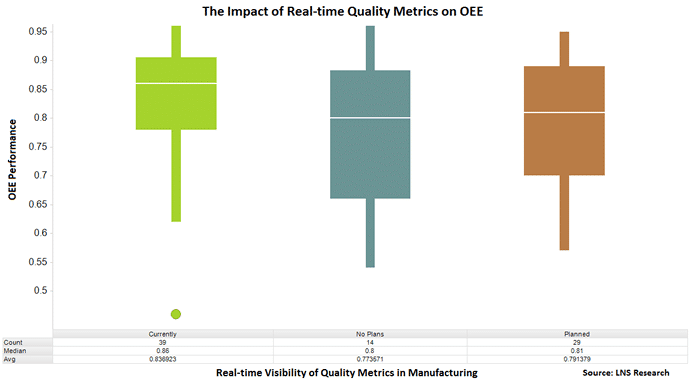 As you can see, in OEE performance, executives that reported currently having real-time visibility of quality metrics considerably outperformed those with and without plans. Inspecting this data point further, for companies that currently have real-time visibility of quality metrics, the upper two quartiles have little variability in OEE performance, ranging from 86% to 96%. In contrast, other two responses are less tightly grouped with lower performance in OEE and less consistency. It’s no surprise that organizations are experiencing benefits with real-time visibility of quality metrics. As mentioned, SPC delivers these capabilities and can be implemented much quicker and with less cost than a more extensive solution. SPC delivers the ability for organizations to measure, analyze, and reduce variability of specific quality issues in real-time, directly impacting OEE performance, and consequently, long-term revenue growth and manufacturing efficiency.